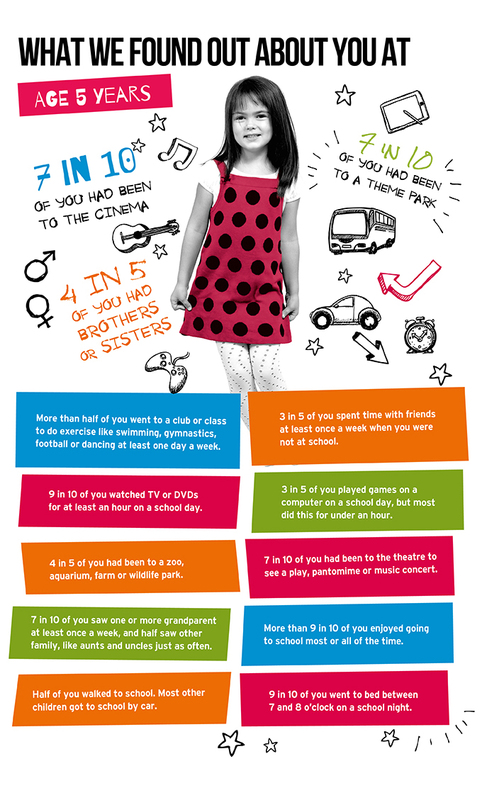 The Age 5 Survey took place in 2006, with 15,246 families and 15,459 children taking part. NatCen interviewers carried out the Age 5 Survey in England, Scotland and Wales, and the Northern Ireland Statistics and Research Agency (NISRA) carried out the survey in Northern Ireland. Age 5 was a really important age as you had just started school, so had just experienced a very important change in your lives. You had gone through many changes since we had previously visited you at age 3, and we wanted to capture these changes. During the 3 to 5 year period, physical growth is rapid, language develops enormously (using sentences and more and more words), and social skills are forming (such as learning to share and play with others). Also, there is lots of evidence that the first 5 years of life (the pre-school years) are really important for people’s futures, so it was critical to understand your lives at this key age. What did we ask about you and your family? We asked your parents to tell us about your family, your home, your friends, your health, how you were getting on at school and how you like to spend your spare time. In some families we also asked older brothers and sisters to fill in some questions on their own. The interviewer also asked if you could be weighed and measured again to see how much you had grown. The interviewer did some more activities with you to see how you were developing, including answering a question about a story, naming a word from a picture and copying patterns with foam tiles and bricks. Who else did we talk to? Information was also collected from teachers on your first full year at school. Evidence from Child of the New Century on the importance of the pre-school years has been used to support the Welsh Government's early years and childcare plan.